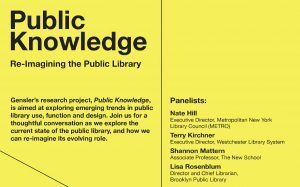 I collaborated with the Architectural League of New York and the Center for an Urban Future to organize a design study that identifies the challenges that New York’s branch libraries face, and proposes design solutions to stimulate conversation about means to support the city’s three library systems and the vital services they provide. In consulted on the request for qualifications; attended research meetings; served on the jury that chose the five finalist teams from among 45 applicants; delivered presentations on current library design trends; consulted with library leader Nate Hill about experimentation in library programming and design (our interview was published in Urban Omnibus); contributed to the development of the teams’ design challenges; attended review meetings and served as a critic at the mid-process review. The findings of the study were presented in a public forum at the Japan Society on December 4, 2014; lots of city officials, designers, and library directors from across the country attended. The design teams again presented their proposals in a more design-focused — i.e., less policy-oriented — forum at The New School on January 12, 2015; I moderated that event. And the following summer I was commissioned to write a reflective essay about the process: my “Middlewhere: The Landscapes of Library Logistics,” which again appeared in Urban Omnibus, examined the critical links between the nodes our regional library systems.